(Clive, Iowa) January 25, 2019 – Gracie Greiner, Washington; Carli Grau, Newell; and Isaac Wiley, Walker are the 2019 Iowa Pork Youth Leadership Team. They will spend the next 12 months representing Iowa pork producers and educating others about pig production and pork. 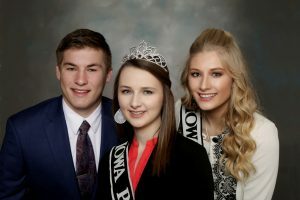 The 2019 Youth Leadership Team includes Isaac Wiley, Walker; Iowa Pork Queen Gracie Greiner, Washington; and Carli Grau, Newell. The Youth Leadership Team members also will gain valuable public relations and leadership experience through the many opportunities that these positions provide.